Today is a bonus rest day. After five nights in Belfast, a north wind was forecast for the next day (mostly a make-believe story the weather people tell to cruisers trying to head toward home) and off I went. Light wind, that eventually filled in from the southwest, but the tide was going our way starting at about 6 AM. 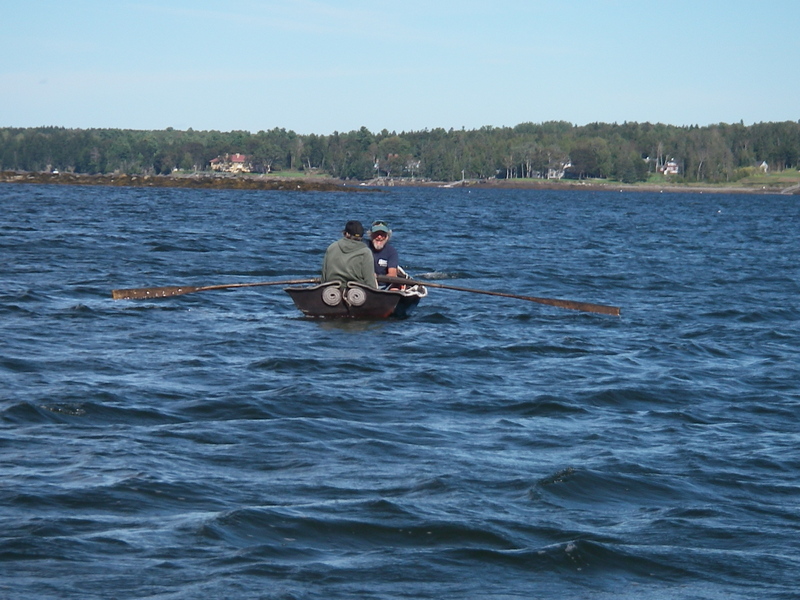 It runs hard enough through West Penobscot Bay to actually make progress, even when there isn’t much for wind. The extra treat was that Joanne, of the Pacific Seacraft 25, came for a sail here on AUKLET, for the first half of the day. What a pleasure that was! We left the harbor with the sun rising and a tiny breeze, and two other sailboats also under sail. Joanne’s friend Paul, out for the day from Belfast in his cruising sailboat, JURA, and Margot and Ed on their very sweet wooden ketch FROLIC. Eventually there was a little more breeze, and they all left us in the dust, both of those boats having substantially longer water lines as well as plenty of sail area to match. But it was fun to be actually getting ahead of them earlier, when we had some good luck with being in the right spot for riffles on the water. Later, when it was time for Joanne to get back to Belfast, Paul very kindly came back our way and picked her up off the boat. This particular maneuver, of crew transfer underway, was new to me with such a big boat – a Westsail 32 – and I’m still thinking on how that went. Among other things, it goes against basic intuition to be sailing along and have a giant boat come alongside, under power, a couple of feet away, water moving at about 3 knots under the boats. Sheesh! I did let out the main sheet so AUKLET quit going quite so fast, which Paul managed to match in spite of some lack of proper communication on my part, so then it didn’t feel quite so hair-raising. Paul had put out three big fenders, complete with fuzzy jackets, and when the two boats came right next to each other Joanne tossed her dry bag onto JURA and then very nimbly hopped over. This exercise is not something that I really want to do again! Though it was lovely to not have to go all the way in to a dock, and then back out to continue the rather slow progress we’d been making in the fussy wind. It occurs to me now that when the Coast Guard does this maneuver I believe that they are usually using their large inflatable boat, which has a much softer surface, all the way around, compared to a big fiberglass sailboat with a few fenders. If I had to do it again, I would suggest more fenders, both further forward and further aft from the ones in the middle where you expect the boats to touch, just in case. And Margot and Ed suggested that tying the boats together, as for a tow “on the hip,” would be far more secure than simply holding nearby and scrambling. I’m quite open to comments on this successful but rather fraught adventure! So now I’m still in Cradle Cove. FROLIC – with Margot and Ed and Joshua Slocum the cat – were on their way this morning. They’re also bound for Tenants Harbor, as a next destination along the way home. But the forecast for today, and the actual look once morning came, gave me that feeling that I would be spending a lot of time floating in the current between occasional bits of wind from an assortment of directions. I could’ve been wrong about this – and a couple of times there was a sweet looking north breeze, and I had definite second thoughts – but now it’s early afternoon and I’m glad that I stayed. It’s 20 miles to Tenants Harbor, and an enormous north wind is forecast for tomorrow. If all goes well, I should have a nice ride in the morning and get to go the whole way.